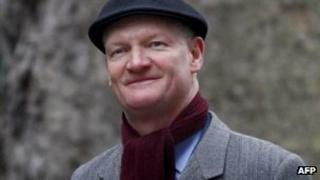 Science Minister David Willetts has become the latest UK politician to announce a visit to the Falklands. On Wednesday, it emerged that MPs from the Commons defence select committee were planning a trip to the islands - news which prompted anger in Argentina. A spokesman for Mr Willetts said he would make a "transiting visit" en route to an engagement in Antarctica. Tensions have risen in recent weeks between the UK and Argentina over the sovereignty of the Falklands. April marks the 30th anniversary of the start of the Falklands War. Mr Willetts' spokesman said he was making a "long-planned" tour of the British Antarctic Survey in Rothera and would call at the Falklands on the outbound and inbound legs of his journey to pick up connecting flights. He said the Conservative minister did not have any "official" engagements planned during his stopover. But the Times newspaper reported that Mr Willetts would hold talks with British military commanders while on the islands. He is also due to host a dinner with Governor Nigel Haywood and hold discussions on policy matters, including whether the islands' students should have to pay tuition fees, the newspaper said. Mr Willetts also reiterated the position expressed by Prime Minister David Cameron that the Falklands would remain British as long as islanders wanted to do so. "What matters is the right of self-determination of the people in the Falklands," he told the Times. Argentina has called on the UK to enter into negotiations over the islands' future - something Britain has refused to do. The impasse has sparked strong words from both sides and prompted United Nations secretary general Ban Ki-moon to issue a statement expressing "concern about the increasingly strong exchanges". News of the visit by the defence select committee was described by Argentina's foreign ministry as another sign of Britain's "militarisation" of the South Atlantic. It has also accused the UK of sending a nuclear submarine to the region and condemned the current tour of duty being carried out in the Falklands by Prince William. Labour MP Thomas Docherty, a member of the defence committee, insisted the visit was "not a ramping-up thing" and it was right for MPs to travel to a place where British troops were stationed.